Train Operating Compan (TOC) Northern Rail has exceeded even the most ambitious of expectations. Another feather to its cap is the title of the "First TOC to Advertise the All-Lines Railrover". We stumbled across it at the end of last week, though due to a planned jolly to the Mediterranean (post to follow, tomorrow!) were unable to upload details. Luckily, readers of RAIL will have spotted that, in his latest column, Barry Doe has given Northern suitable credit. The All-Lines Railrover is the most expensive Railrover that can be purchased. As its name suggests, the holder can travel on all National Rail services in the UK. Yet no publicity has ever been given to this ticket. 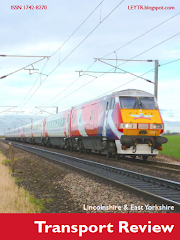 The Association of Train Operating Companies (ATOC), who is ultimately tasked with producing the publication, has shyed away from doing so as billing each TOC for their proportion of the cost would, apparently, be rather complex. According to Barry Doe, they've also used the excuse that the All-Lines Railrover is only ever used by enthusiasts "who know it exists". Proof, however - if ever it was needed, is shown below. 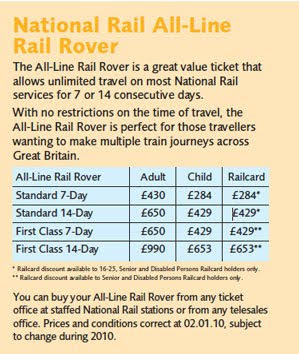 The advert for the All-Lines Railrover forms page 5 (of 8) in Northern's 2010 publicity promoting its own plethora of smaller, more localised Railrovers. The All-Lines Railrover cannot be seen when searching an equivalent online page within Northern's website, which is a shame; instead, the pdf version needs downloading.